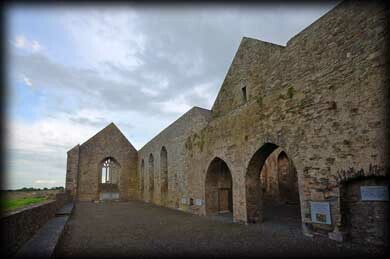 The monastic site at Aghaboe has a tortured history of plundering, burning and rebuilding. Founded by St Canice c 576, the original Abbey served as a centre of learning, commerce and agriculture. It was plundered by the Vikings in 913 and rebuilt in 1052 with relics of St Canice enshrined. It was again burned in 1116 and built in 1189. 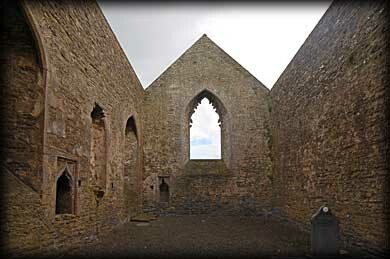 During this period it served as an Augustinian priory and was the cathedral church of the diocese of Ossory, to which the High Crosses of Ahenny and Kilkieran are attributed. It was destroyed again in 1346 as a casualty of an attack on the Norman castle on the adjoining motte. Today a Church of Ireland, which dates from the 1700s, stands where that priory once stood. Incorporated into the church are fragments of the Augustinians’ buildings, which include a Medieval carved limestone head on the east side of the doorway and a small belltower that has the same proportions as one from the 1200s. In 1382 Finchin Fitzpatrick built a Friary just west of this church which was granted to the Dominicans who served the area for the next 4 centuries. The friary contains a beautifully carved three-light window. In 1984 the ruins were restored. Located on the site is a motte. A wooden tower would have stood on top of this mound and served as a place to store arms and from which they could keep a lookout for potential attackers. Because it was quite late when I arrived here I only got a chance to photograph the Dominican Friary and the Motte. But hopefully on my next visit I will get a chance to visit the modern church and photograph some of the remnants of the Augustinian Priory. Situated: From Portlaoise head SW on the R445. At roundabout take the second left onto the N7. Then turn left for Rathdowney, Then left again onto the R434. The Abbey is situated down this road on your left. There is a car-park just past the Abbey. Discovery Map 60: S 3268 8581. Last visited August 2010.